Radiation therapy or radiation involves use of high-energy radiation to kill cancer cells or shrink tumors. The radiation is usually delivered by X-ray, but may also be done by gamma rays or via charged particles, such as proton therapy. The therapy may be standalone or in combination with other cancer treatments, including surgery and chemotherapy. Radiation may also be used palliatively, to relieve symptoms of cancer but not necessarily to cure or treat. External-beam radiation therapy – the most common type of radiation therapy, usually done with a machine called a linear accelerator that delivers doses of radiation to a certain part of your body. Intensity-modulated radiation therapy (IMRT), three-dimensional conformal radiation therapy (3D-CRT), tomotherapy and stereotactic radiosurgery are all examples of external-beam radiation therapy. 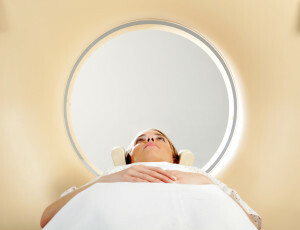 Internal radiation therapy or brachytherapy – when radioactive material is placed in your body, close to cancer cells. Systemic radiation therapy – when radioactive iodine is injected into your body and moves throughout your blood to deliver radioactive material throughout the body. The intention of radiation therapy is always to preserve the surrounding healthy tissue as much as possible while destroying the cancerous cells. Normal cells can regenerate and help repair damage caused by radiation therapy. Radiation treatments can be quite intensive, usually for a course of five days in a row, and spread out over the course of several weeks. Before you begin treatments, your radiation therapy team will help you prepare by determining exactly what areas of the body will receive radiation and in what dosage based on your type and stage of cancer as well as other factors such as your overall health. Treatments generally last from 10 to 30 minutes and you may be asked to lie still while holding your breath at different intervals while the radiation dosage is delivered. You will be awake and able to communicate throughout the treatment. Although radiation treatments are painless, you may experience side effects such as hair loss (at the site of treatment), mouth sores, changes in the way your food tastes, nausea, vomiting and diarrhea. Some side effects may be short-term while others may be permanent. After your course of treatment, you may need periodic scans to determine the effectiveness of radiation therapy treatments.